This post is inspired by Haiku Heights prompt “Dusk”. After I retired from teaching, one of the jobs I did was running an after school creche for children at King’s School in Gloucester. This was a delight and a privilege as the school is set in the grounds of Gloucester Cathedral to which it is attached. The children were cared for and amused until 6pm or whenever their parents picked them up. During this time we could hear the choir singing Evensong or Vespers which they do daily at 5.15pm. It is a beautiful time of day when the sun is going down, the body clock is slowing down, and children need to unwind. Nothing could be better than to relax to the sound of well trained choristers singing their thanks for the day before their evening meal. Gloucester’s historic cathedral cloisters were transformed into the corridors of Hogwart’s School of Witchcraft and Wizardry in the films of JK Rowling’s first two books – Harry Potter and the Philosopher’s Stone and Harry Potter and the Chamber of Secrets. There was the strictest of security to keep out the curious world’s press while filming took place – but now some of the movie-makers’ secrets can be revealed. In fact there is a Harry Potter trail at the Cathedral which visitors can follow and there are still signs of Hogwarts to spot! All modern signs, locks and electrics had to be disguised under panels painted to look like the stone walls. There are cunningly concealed electric light switches inside the East Cloister door? For the films anything that would give away the set as a church had to disappear. The haloes on the stained glass figures in the cloister windows were painstakingly covered with coloured plastic filter paper to blend in with the surrounding glass. 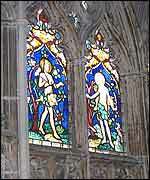 One window has figures of Adam and Eve, and because these might have been in shot in the movies, they were given clothes and even the trademark Harry Potter ‘lightning flash’ on their foreheads! There are nearly 100 tombstones on the cloister floors which had to be disguised during filming. They were covered with roofing felt, which was then painted, marked, polished, varnished and made to look faded to match the rest of the stone-flagged floor. 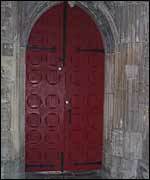 The red door in Dark Entry, at the north-eastern corner of the cloisters, was where the flood from the girls toilets was filmed. Water from a tanker parked in the road outside was pumped through the doorway, into a huge specially constructed container and out to a drain in the Garth (the cloister’s central garden). The wall by Dark Entry is where panelling, made in the studio to look just like the stone walling, was hung with the chilling message in ‘blood’ – really a film-maker’s magic potion – that read: The Chamber of Secrets has been opened – enemies of the heir BEWARE! In Harry Potter and the Philosopher’s Stone, Rik Mayall, as playful poltergiest Peeves, set all the broomsticks zooming about in the East Cloister walk. Unfortunately the scene was one of several that ended up on the cutting room floor because the film had to be cut to a manageable length. The Lavatorium on the left hand side of the North walk (yes, it’s really called that – and it wasn’t the ancient Abbey monks’ loo but the place they washed) is where Harry and Ron hide from a giant troll behind the pillars. The troll in the film is mainly computer-generated, but huge legs were used in filming to make it look more realistic – so big that there was some difficulty in getting them in through the cathedral’s massive main doors! For filming the cloister walks were lit by special gas-fired torches using a special gas that would not harm the ancient stonework. As you come to the end of the West Walk the oddly-named West Slype door is on your right. 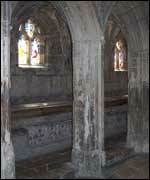 A slype is the name for a covered passage from a church or monastery cloister. 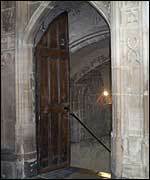 In the films it was made to look smaller by means of a plastic mould placed over the real doorway, with a hinged portrait of the Fat Lady in front of it, and became the entrance to the Gryffindor Common Room. In real life steps lead down from the other side of the doorway but more film wizardry was used to make it look like the common room. A false floor on stilts was built sloping slightly upwards to a backlit screen with a picture of the common room – a film-making device called a translight. This entry was posted in Cotswolds, Education, Haiku, Photography, Spirituality and tagged Gloucester Cathedral, Haiku. Bookmark the permalink. What a wonderful post… I love the photos and the story you shared. TY! Beautiful photgraphs, made me wish for a visit to this place! Ancient prayers still stir our soul! Beautiful!! Your haiku evoked the haunting sounds of a choir sining at dusk. The photos are beautiful too!! Thanks for sharing! The scenic beauty of Nature’s choir closing the day is beautifully captured! And love the extra layer of timelessness! Always a delight to read your haiku followed by a wonderful guided tour! An excellent memory of dusk.